Discussion in 'Muppet Headlines' started by Phillip, Dec 16, 2010. Check this out at the top of the page. It looks like Disney has rolled out a new logo for the Muppets featuring Kermit's collar. It will be interesting to see if this shows up in other places as well. What do you think? Let us know if you like the logo or if you prefer some of the other logos Disney has used. Looks like the M is wearing a bad hairpiece. I like the logo on the MR boxes. Yuck. It looks like a leaf fell on top of the M and died there. Or maybe someone is trying to make a statement about what they smoke in their free time. No likey. If it'll just be for the movie, fine. It looks kinda odd though. I'd much rather have the older, Muppet-show typeface logo. I'm not sure if I like it - the base of the "M" make it look like Kermit is slighty anorexic or something because it looks like his arms and legs are SUPER skinny. But maybe it'll grow on me. I agree, but I do like it as a movie logo if that's what it's for. 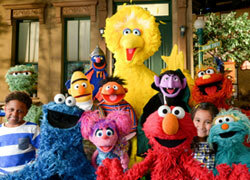 It'd be sort of cool if they made the other letters look like other Muppets' bodies somehow. It's not a bad logo though with just Kermit. Mmm... I don't care for it, myself. It looks gimmicky. There are multiple things I dislike about it. The type face, save for the Kermit M is very VERY bland. And in a overly simple black font color as well... it just doesn't pop. Secondly, I dislike the Kermit M completely. Unless the other letters were other characters, then it would be cute at least. Third, I don't know what I hate more, the word THE or the Disney over the logo. They have been doing a great job integrating the brand, but keeping it a separate entity all its own. I'd hate to see the Disney logo over the word Marvel. Now, if I had a say, I'd love to see something like Disney presents the Muppets (created by Jim Henson) and at least bridge that together... not saying "Jim Henson's Muppets" or any relation to the Jim Henson company... just a little side thing that says "Created by" similar to "Nickelodeon's Spongebob Squarepants (created by Steven Hillenberg)" That does NOT imply ownership, but rather gives credit to bother the true owners and the one that came up with it. And frankly, the classic Muppet Show font works WONDERS. It's just a great looking showy font, it's been around forever, and it just gives a bold impression. This is just less than impressive. Quick pop back since branding is a skill of mine. I don't see why this timeless look isn't used over that clever, but contrived art school student looking composition. Keep it simple! It doesnt impress me.Maybe they could try putting Kermit's eyes in the cavity of the "P's". Yes, the artwork looks too loaded up on the left.Maybe "uppets" shouldnt be there, but then some people wouldnt know who "The M" are! You should work for Disney.You designed Angelo and this logo much better than them. I'm sure(hope) it's just temporary as a placeholder. If it was red and fuzzy, we'd really get upset, wouldn't we? My guess is that Disney is attempting to draw a distinction between the Muppet brand and next year's Muppet movie logo. Companies are really concerned with that these days and it's kind of silly. They're also trying to brand the name "Muppet" with the "Disney" logo and show that even though Sesame characters are called Muppets, that their Muppets have Kermit. That all comes across here, but not in an attractive way. I'd favor some Kermit footprints or just seeing his distinct pupil shape repeated somewhere. Something a little less literal, but personally I think the simple/classic route is always best. There are ways to make old logos look new and appealing without having to make the letters into Muppet cast members. haha, i'd go with them dumping the whole idea and trying something different. 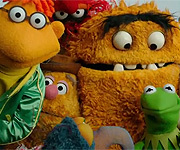 Seeing as the whole movie is a take on the whole "classic" element of bringing back these much loved characters (ie - the plot of getting them back together) I would have preferred something classy and traditional, maybe something based on the the Muppet Theater and it's colours/curtains. I wasn't a fan of any of the most recent logos, too modern, too character based. This logo isn't totally horrible, but I do like the original font from "The Muppet Show" title better. But it may just be a logo for Amazon.com's page- it might even be something Amazon put together for that rather than Disney. I don't know. But either way, it's just a logo- it's not a real huge thing to me. This logo may just be for the amazon store. looks like they are copying Monsters INC.